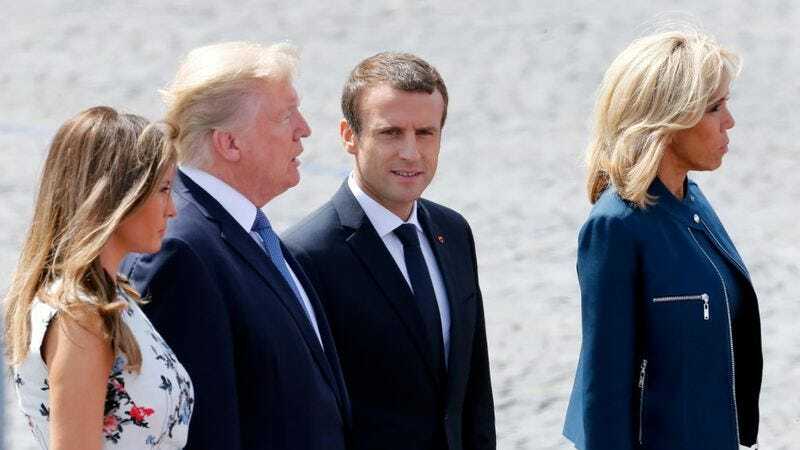 Last week, while Donald Trump was in France celebrating Bastille Day hand-wrestling with the president and failing to enjoy a marching band medley of Daft Punk, our president found time to comment on the body of Brigitte Macron, wife of President Emmanuel Macron. Trump’s unbridled misogyny has been on display since he first entered public life, but he keeps finding new situations in which to drool over nearby women while those around him—and by extension the entire world—are forced to watch. But an unlikely hero has stood up to the president: Reebok. That’s right—a shoe company has decided they have had it up to here with this disgusting behavior. It’s a solid own! There have also been thousands of solid owns on Donald Trump throughout the years, not all of them brand-building exercises. Trump is, paradoxically, completely absurd and utterly bulletproof. Snaring the president in logical traps, battering him with West Wing-righteous rebuttals, and jumping into his Twitter mentions can only offer a moment’s catharsis at best. Perhaps we should take solace instead in the spirit of Bastille Day, when the oppressed French underclass stormed the symbolic seat of corrupt, feckless monarchy, igniting smoldering discontent into a revolutionary inferno. Let’s see Reebok endorse that.